Find out some suggestions of Castle Hotels in Scotland at the end of my article about the best Scottish Castles. I selected and paid for all my accommodations. Opinions are my own. I personally always use Booking.com and Airbnb this is why I do my recommendation via those websites. Loch Lomond is one of the most visited places in Scotland because it is very close to Glasgow and Edinburg. And also because it is located in the beautiful Trossachs Park. Because of its popularity, all the places to stay and Loch Lomond accommodation are expensive and fill up quickly. I opted to stay at the nearby Loch Long just a few kilometers from Loch Lomond. I found this beautiful little house with great views of the loch and modern decor. The accommodation I selected was via AirBnB: Arrochar cottage, near Loch Lomond. We stayed 2 nights. 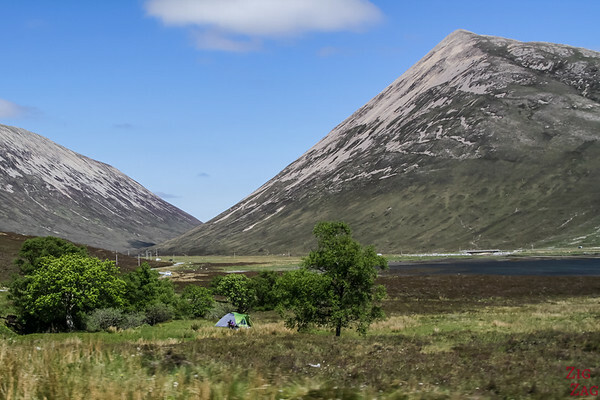 Glencoe is one of the most magical places in Scotland with high summits, sparkling lochs and the connection with Nature. My favorite loch in Scotland was Loch Leven. And I am so happy that I decided to stay at the end of this Loch in Kinlochleven making me tour this jewel of a place instead of just crossing it with the bridge. Kinlochleven has a great variety of accommodations. Based on reviews on Booking I selected the Allengrange B&B. ​Location: Not close to the center but quiet on a hill with great views of the mountains. Breakfast: Excellent! The best we had in Scotland with the option of full scottish or salmon, fruits. Nice breakfast room. The most famous Loch in Scotland, Loch Ness is quite long. You can stay in Inverness at its Northern end and visit on a day tour. Or you can stay in Drumnadrochit that is the main town at the middle of Loch Ness not far from the famous Urquhart castle. Being a touristic destinations, the places to stay at Loch Ness fill up very quickly. Based on what remained available and reviews on Booking.com I selected the Springburn B&B in Drumnadrochit. Location: Nothing special. Easy access. Breakfast: Good breakfast Scottish or Continental. Where to stay in Scotland ? Isle of Skye.. The Isle of Skye is considered the gem of Scotland, the best Scottish island. Therefore you need to book in advance to have a good choice. I booked very very late and nothing was left. I really wanted to stay on the island so I splurge and booked a very nice accommodation: Quayside apartment in the heart of Portree where the colored houses are. If I had had the choice, I think I would have booked one night either in Portree or more isolated in the North and one night in Elgol to be able to see more of the magic Cuillin Mountains. For those traveling to the North of Scotland, there are 2 main towns to stay before reaching the North Coast: Kinlochleven and Ullapool. Considering the distance we had to drive I opted for Kinlochleven. State: Clean and simple. Comfortable beds. Bathrooms are shared but sufficient and separated from toilets. Wifi OK. If you take the ferry to Orkney Islands, it is practical to stay in Thurso, a couple of km from the pier at Scrabster. Based on price, location and studio-like room with more space, I opted for a stay at the Station Hotel. Another option to sleep on the ferry: if you take the 6am departure you can get on board the evening before and book a cabin. With iconic neolithic sites to visit, Mainland Orkney is one of the top Scottish Islands to explore: with the Ring of Brodgar, the Standing Stones of Stenness, Skara Brae... Take the ferry and spend one night! For a question of budget, I was looking for a cheap accommodation not far from the ferry wharf. I opted for the Orca Guesthouse which was recommended by the visitscotland website. Check-in: Very nice person to receive us. No issues. Especially if you take the ferry the next morning, Stromness is a great place to stay in Orkney. Inverness is one of the best towns in Scotland. It has a lot of charm with many many B&Bs. Based on reviews on Booking.com, I selected the Kilcumin Guesthouse. My mum insists that I tell you how great it was. She really enjoyed it. Check-in: Very nice welcome. All is made for you to feel good. Many information provided. Not wanting to stay in the Cairngorm National park, we drove further South to the magnificent Lochs between the park and the Trossachs. My choice ended up being the Tulloch ﻿﻿Cottag﻿﻿e in Lawers along Loch Tay where we spent 2 nights. It was one fo the places we enjoyed the most. Great for relaxing. Location: Isolated above Loch Tay with great views. Very quiet. Check-in: Nice couple. They own the house nearby. We had delicious fresh eggs waiting for us. There is a lot of choice on Airbnb for places to stay in Edinburgh. I selected Thistle Street Apartment because I wanted to be able to walk everywhere. Location Location Location. Location: perfect - easy to walk to the castle, the Royal Mile and Castle Hill. (although remember that Edinburgh is not falt at all). Many restaurants around. Check-in: Kyebox with code at another place nearby. No issues. Glasgow is not an easy city to get around. The things to do are everywhere. I selected on AirBnB the City Center Suite because of the balance location-price. Sorry I forgot to take my own pictures. Location: Not too far from the city center (you can walk there). There is a nearby stop for the Hop On Hop off bus. State: Fine. Good space. Dining table not the most practical. Good if you are 2, not so much if you are more. As we made our way South through the Scottish Borders we stayed right at the border in a small town called Gretna Green. I selected the Hazeldene Hotel based on reviews and price.